This Painting is the courtesy of "History of the ancient & Medieval World" Volume- II, Isbn 0-7614-0362-0(V.II).He heard that Holy Pir was in Istanbul.He rushed to Istanbul from Madina in about a week by Yakka.He accompanied the Almighty Satguru from Istanbul and spent about two months in Greece.He was a thoroughly changed guy in the Holy company of Almighty satguru Nanak Sahib and Bhai Sahib Mardana Ji. 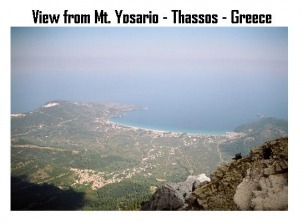 The mountain Ypsario in Thassos Island in Greece where Martin Luther happened to stay. He and Satguru Nanak have discussion in Persion Language in 1520.The name of the building where the discussion took place is"Ilahi Nur". Martin Luther(1483-1546) knows how to speak, understand and write Persion language. (by courtesy of Google Earth). 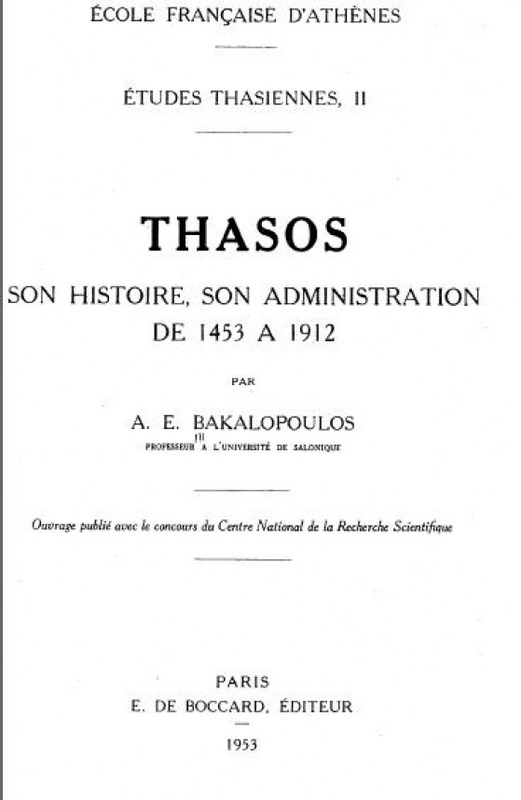 The French Book Which Confirms Sultan's Stay on Thassos Island. The French Book published in Paris in 1953 which confirms the stay of Sultans of Ottoman Empire on Thassos Island, which has Mt. Yapsario on it. 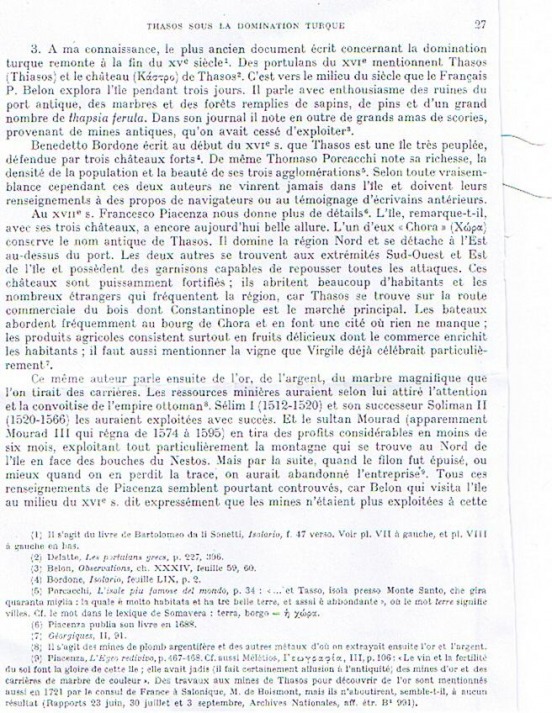 Page 27 of a Book published in1953 in French. 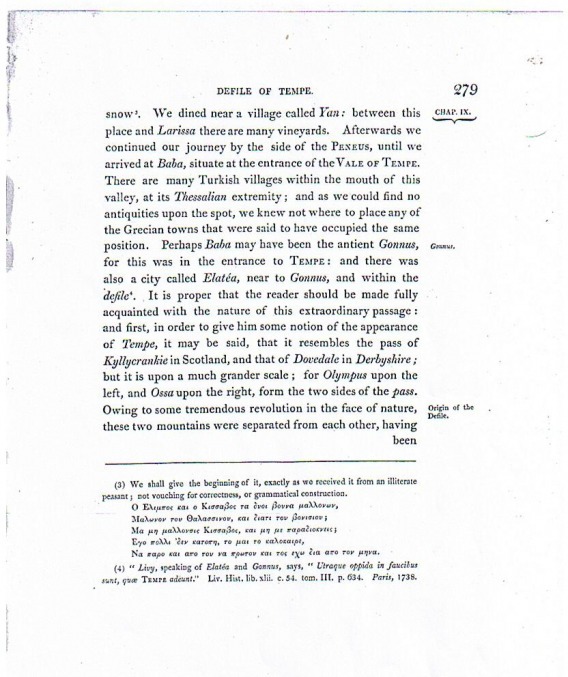 The Twenty Seven page of the French book shows that Turkish Sultan, Selim-I, Sulayiman and others used to stay on Thassos island because it was gifted with different minerals. 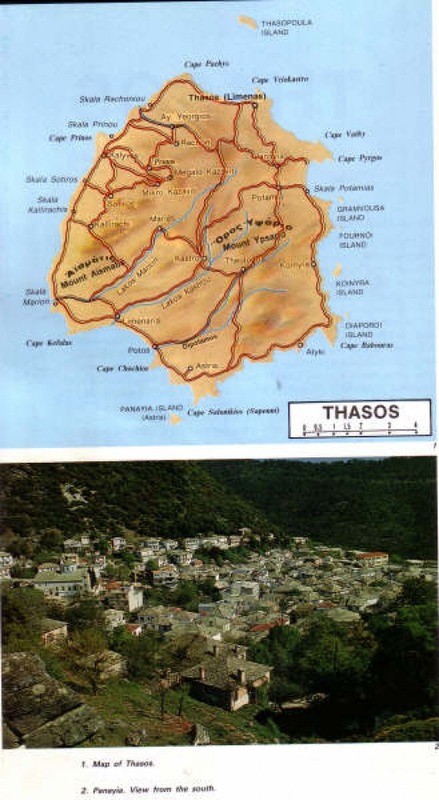 "Thassos"itself is known as a stone in Greek Language. Nicholas, Copernicus (1473-1543) who was a passenger of the ship in the Velore sea port of Albania and has discussion about Sun, Moon and other various things of nature with Almighty Satguru Nanak Sahib in 1520 on his way from Alexandria Library in Egypt and Athens to Rome in Italy. In the Renaissance period all the literatures and information reached Europe in four main Languages-Portugese,Greek,Persion, and Syriac.The East India Company started its business in the Mughal Period of Emperor Jahangir.So Persion was a compulsion for learned persons and scientists as Greece and other countries had been under Ottoman Empire for many centuries. (by courtesy of www.galaktia.com). Leo-x had a discussion with the Almighty Satguru Nanak Sahib in St.Peters Square in Vatican Rome where the Roman Emperor Charles-v had listened to Great Saturu's Views on this universe and the life Hereafter(Pralok)Leo-x,Nicholas Copernicus and Martin Luther were his translators as Charles-v(1500-1558) did not understand Persion(Note that Martin Luther's writings were declared Anti-Christion in JUNE 1521 where as the Almighty Satguru and Bhai Sahib Mardana Ji had visited Rome in March/April of 1520.Moreover, Martin Luther had the support and security of the Roman Emperor Charles-v(His letter to the Roman Emperor dated Jan 15, 1520 has confirmed it)(by courtesy of en.wikipedia.org). 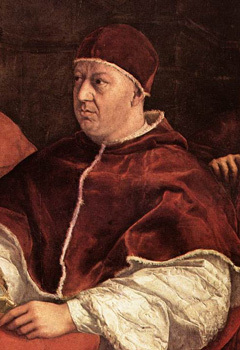 The Roman Emperor,Charles-V who listened to the views of the Almighty Satguru Nanak Sahib in St. Peters Square in Vatican Rome in the early spring of 1520(by courtesy of http://en.wikipedia.orgn). The picture of Human Body with Kirlian Camera. This is the picture of the physical body which is perishable.The astral body is answerable to deeds however good or bad.The holy Guru Granth Sahib Ji has defined in this way-Kah(u) Ravidas Bhayo Jab Lekho Jo Jo Kino Soi Soi Dekheo" Pious page no. 1293 of SGGS. These Pious lines mean that whatever I did in my life, I see the same with my own eyes(astral eyes)in the life hereafter( By courtesy of http://www.csicop.org). The picture of the Aura. This is the picture of the aura which is non-perishable.This body is answerable to deeds however good or bad.The holy Guru Granth Sahib Ji has defined in this way-Kah(u) Ravidas Bhayo Jab Lekho Jo Jo Kino Soi Soi Dekheo" Pious page no. 1293 of SGGS. These Pious lines mean that whatever I did in my life, I see the same with my own eyes(astral eyes)in the life hereafter(By courtesy of http://www.csicop.org). 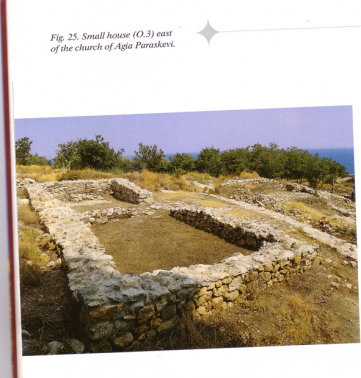 The Smallest Unit of the Romans is"Romai". Holy Page No. 822 of Sri Guru Granth Sahib Ji gives the philosophy of Roman theory" Romai"is an exact Italian Word. In Italian ,"Roma" is called Rome and 'ai' is called "to the".This means Romai=Rome+Ai>In this holy Shabad of Raag Bilawal of Satguru Arjan Sahib there is the mention of the limitation of human being of praising the Almighty God in full.A human being can not describe one Rome and there is no question of describing the whole creation of the creator. 'Romai is cent percent Italian world which has been adopted by Punjabi and Gurmukhi.The Shabdarth of SGPC and Amir Bhandar of Baba Kirpal Singh have rightly given the meaning of Romai as the Physical Brahmond and not the traditional the small part of the body.This is the biggest Panthic proof which is confirmed by the fifth Nanak, Satguru Arjan sahib in the Holy Guru Granth Sahib Ji. Satguru Nanak Sahib is "Jagat Guru"and he came to Greece and Rome to teach the wrong people there the ultimate truth which is present every where and which will be in future. "Aad Sach Jugad sach-------" Holy Page No.1 of SGGS.He went not only to Greece and Rome but to Albania, Yugoslavia, Romania and other countries on His way to Russia.Page No. 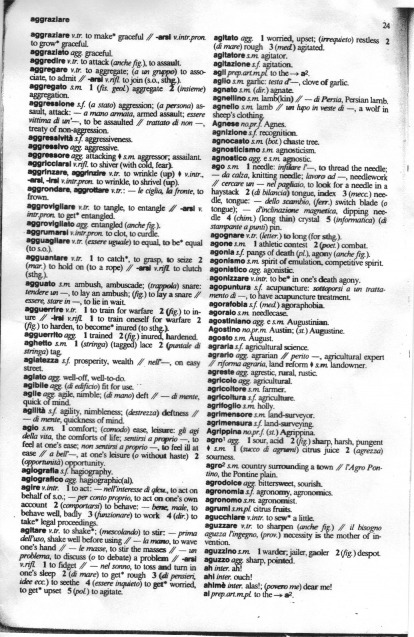 893 of Harrap's Concise Italion Dictionary first published in Great Britain in 1990, gives the meaning of "Rome" as" Roma" and "Ai" as "to the" which refers to the Roman belt of this universe. (by courtesy of Darpan by Prof. Sahib Singh). Page no.822 of "Shabadarth" gives the hint for smallest unit of the Roman.Satguru Arjan uses the "Tatsam" word of Italian Language. "Tatsome is a word which is used in the original form. "Tadbhav" is the word which is used in indirect form. 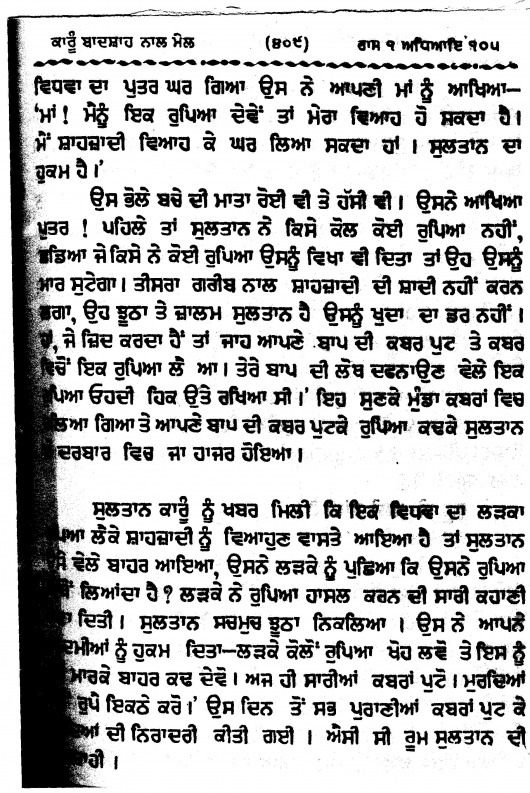 (by courtesy of Shabdrth published by SGPC, Amritsar in 1995). Page No. 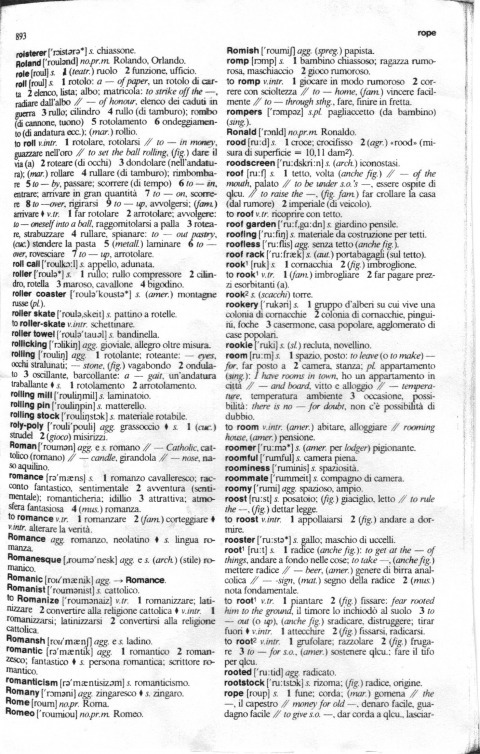 893 of an Italian Dictionary Confirms "Rome" as "Roma". Page No. 893 of Harrap's Concise Italian Dictionary defines the word "Rome" as "Roma"Satguru Arjan sahib says in these Holy Lines that the smallest unit of Roman can not be described by human being, the whole of the universe can not be described by the human being(by courtesy of Harrap's Concise Italian Dictionary). Page No. 24 Defines "Ai" as--To The". 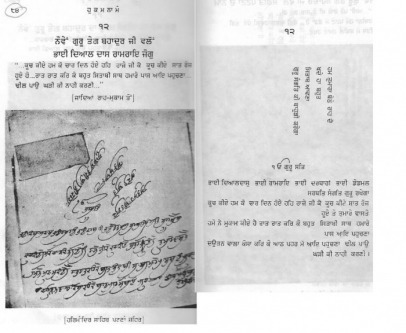 Panthic Proof given by Kavi Santokh Singh in 1823. Satguru Nanak Sahib was in Madina.This the page from Nanak Prakash which appeared in Sammat 1880(corressponding to 1823 A. D.)>From Madina Sultan Selim-I accompanied the Almighty Satguru either on yakkas or through ship(by courtsy of Nanak Prakash published by Chatar Singh Jiwan Singh, Amritsar). Satguru in Rome, Confirms Kavi Santokh Singh. This is the page of Nanak Prakash written by Giani Santokh Singh. Satguru Nanak Sahib and Bhai Sahib Mardana Ji went to Baghdad and other countries and then to Greece and Rome(by courtesy of Nanak Prakash published by M/S Chatar Singh Jiwan Singh). Satguru Nanak Sahib Met Catholic Pope(Leo-X). Almighty Satguru Nanak Sahib was told by the people of Iran(Persia)the atrocities committed by Sultan Hamid Karun.Satguru decided to rectify him.Due to ancient names in Janamsakhies, some historians have wrongly related the meeting of almighty Satguru Nanak sahib with Hamid Karun in Rome whereas this meeting took place in Iran.Karun is a river in Iran and Sultan Hamid belonged to Iran. Actually, Shah Ismail-I has been misquoted as Hamid Karun. He has got this name "Karun" from the Karun river. He collected enough money by hook or crook. Satguru Nanak Sahib tought him the right path and he distributed his ill-gitten money to the poors.Surinder Singh Johar has rightly pinpointed in his book Sri Guru Nanak Dev Ji,published by Sri Parkashan, Delhi-32 in 2004.But in his above said book he thinks that there was no Hamid Karun and some body has attached the fabricated story with Satguru Nanak Sahib. But for the kind information of the Holy congregation, it was the Shah Ismail-I who was called Hamid Karun(A river named Karun in Iran) by some historians and Bhai Kuer Singh who wrote "Janam Sakhi Bhai Mani Singh". 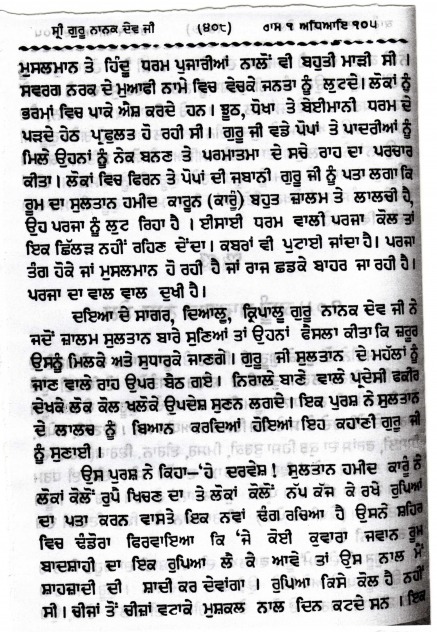 ( Pages 406-409 Of Gurpartap Suraj by Kavi Santokh Singh by courtesy of M/s Chatar Singh Jivan Singh's book written by Giani Inder Singh). 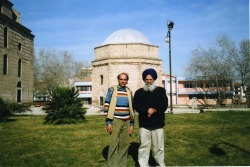 Satguru Nanak Sahib and Hamid Karun. Sultan Ismail-I Karun's thirst for money.Shah of Iran, Ismail-I is misquoted by some historians. They Tie their Hair in this Way. This is the picture which is taken from the book 'Wesrern Europe'which shows the style of hair tieing in Greece in Ottoman Empire. During that period people used to tie hair in the back of the head instead of Top-Knot. (By courtesy of the book, Western Europe 2004). Picture of page no. 127. This is the picture of page no. 127 of the Martand of Giani Lal Singh Sangrur. This Gurmat Martand was Published in 1941 by Lahore Book Shop,Lahore.This Gurmat Martand has confirmed Almighty Satguru's preachings in Rome. Picture of page no. 128. Picture of page no. 14. Pontano was Martin Luther's Guide and Forerunner. This is the picture of page No.66 of the book named 'Pontano-Poet& Prime Minister written by Carol Kidwel. Last two lines clearly confirms that Reformation started at Naples by G.G.Pontano.This criticism of church shortcomings stopped in 1503 with the death of Pontano. 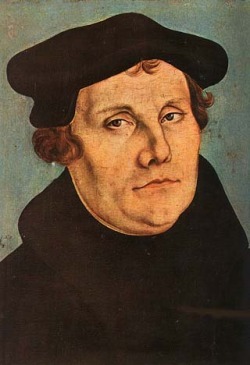 Martin Luther carried Pontano's work after Pontano's Death. (by courtesy of the book, "Pontano-Poet& Prime Minister written by Carol Kidwel). 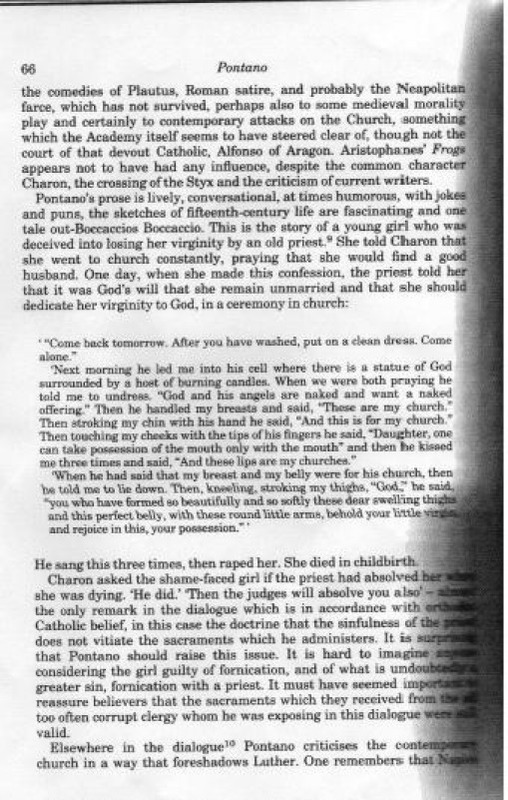 Page 67 of the Book on Pontano. This page clearly shows that Italy became one of the first centres of Reformation. (by courtesy of the book, Pontano-Poet & Prime Minister written by Carol Kidwel). This is a poem written by G.G.Pontano who was a poet and the Prime Minister(chancelor) of Naples in Italy.He went to India and happened to see the Almighty Satguru on the bank of Ganges in Hardwar in 1501.Almighty Satguru was throwing water in the opposite direction that is in the West.Pontano was impressed by the logic of the Satguru.In this poem Pontano remarks"Midst farthest Ind,where, Ganges rolls his floods-----Where man a different offspring seems to rise;" This Poem was published by Roscoe William in his volume Pontificate and Life of Leo the Tenth in 1806 in London(U.K). 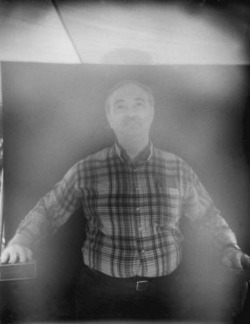 Pontano G.G. (1426-1503) was the Chancellor or the Prime Minister of Naples.He went to India in 1501 and had a glimpse of Great Satguru in Varanasi. 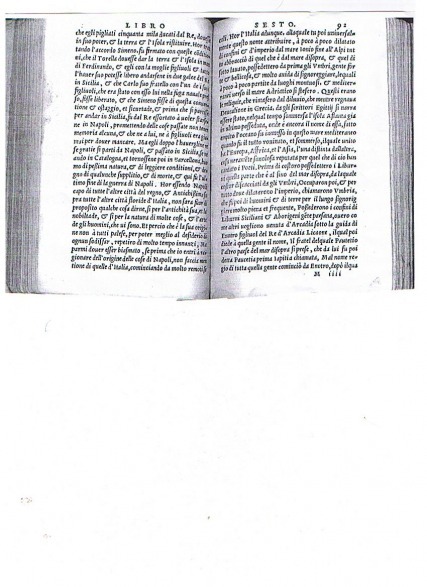 Page 92 of the Abovesaid Book published in 1544.. This is the major first critical book after Pontano's death.This book has clarified that Pontano was had a trip to Europe, one country of Africa(Egypt) and Asia. 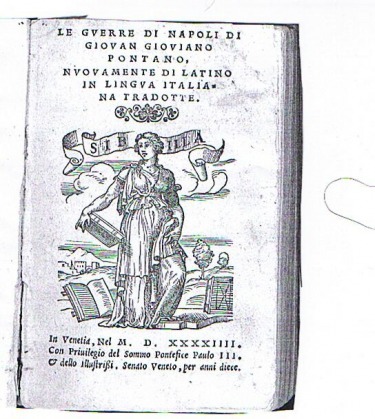 This book was published in 1544 in Venice(Italy). On the right of Page 92 the mention of European country, African country is made. (by courtesy of Thomas Fisher Rare Books Library). The Holy Church in Athens. The Holy Apostle(church) in Agora(market) in Athens(Greece) near Acropolis(on the mount). It was built in 11th century and repaired many times, but Athens has the record only upto the times when Athens was made the capital in 19th century. 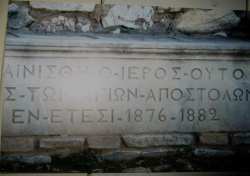 This photo was taken in 1876 before the repair of the roof.It was finally repaired in 1954-57 and it was restored to the public in 1957.This was confirmed to the writer by S. Dumount, Registrar, Agora Excavations Athens, in February, 2008 when the writer stayed in Athens for a couple of weeks. (Please note that black and white photograpy started in Europe around 1780). The roof and some other repair was done to this church in 1876-82.It was finally repaired and restored to the public from 1952-57. The Construction Started in 1952. 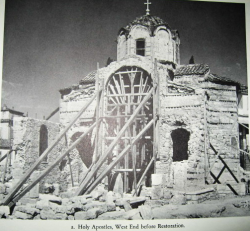 The construction started on the Holy Apostle(church) in 1952.It was totally repaired from all the ends that is from East, West, North and South ends, before it was restored to the public.It took almost seven years for final repair. The Holy Apostle(church) had some repairs on its roof and sides. Then it was thoroughly repaired in 1952-57. 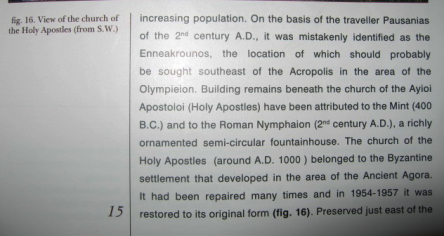 The Holy Apostle(church) was first constrcted in 1000 A.D. This is the picture of the volume no. 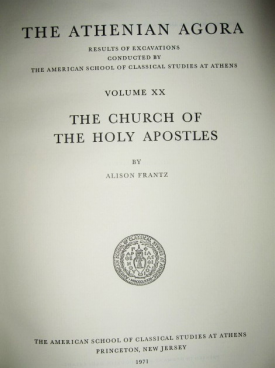 twenty of The American School of Clasical Studies of Athens, Princton, New Jersey, 1971.This volumes contains the whole record of Holy Apostle(church) from the time Athens was made the capital of Greece(formerly called Unaan).This church is located in Agora(market or mandi) in Athens near Acropolis(on the mount). (all the photos belonging to Athens are taken by courtesy sake from the book" The Athenian Agora" published in 1971 at New Jersey). Satguru Nanak Sahib And Sultan Beizeid. This book in Turkish language confirms Turkish Sultan, Beyzeid-11 meeting with Satguru Nanak sahib in Ajmer Dargah in Rajasthan in 1511.The name of the Sultan of Ottoman Empire was Mehmet -bin- Ibrahim and he adoped the name of Turkish 8th Sultan. The books of Greek languages confirmed his his visit to India.Sikander Lodhi was the Emperor of Delhi at that time.He accompanied the Sultan Beyzeid-11 of Ottoman Empire to Lahore. Both Rai Bular Bhatti and Nawab Daulat Khan Lodhi of Sultanpurlodhi were invited to the dinner of Lahore.Both Rai Bular and the Nawab Daulat Khan spoke highly in praise of Satguru Nanak Sahib.Sultan Bayzeid -11 told everyone present there that he(the Turkish Sultan) had the glimpse of this Pir in Ajmer Sharif in Rajasthan.Hence the Sultan family came to know about Almighty in 1511(Hizri 911). Pir Behlol of Baghdad accompanied the Sultan Beyized-11 and the Pir built a monument in the Holy memory of Almighty Satguru Nanak Sahib. The monument in Istanbul(which has been detected by respected Prof. Davinder Singh Chahal), was built by the 10th Sultan of Ottoman Empire, Suleyman, the son of Selim-1( who was the Turkish Sultan from 1520-1566). 458th Page Of Turkish Book. 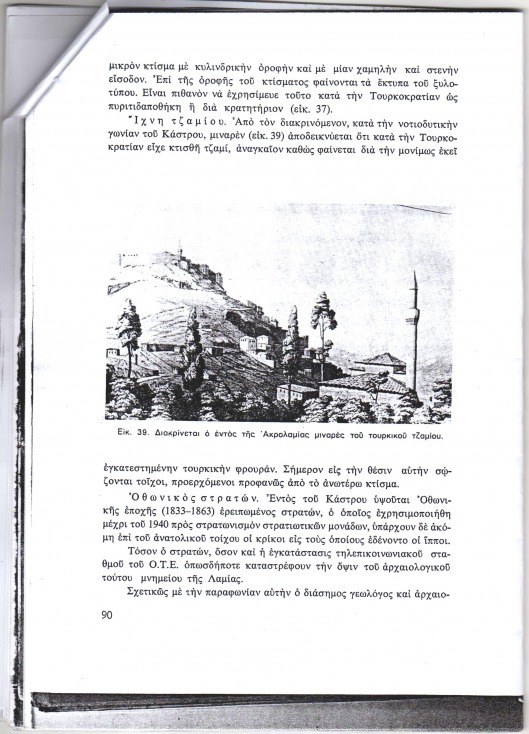 This is the photocopy of the Turkish book which The Genesis Library,Athens, gave me.Kabrini word is taken from the Kabristan(Graveyard) which means in Turkish, Dargah or a memorial. Daki means perfect(puran or complete). The Turkish Book of Istanbul. 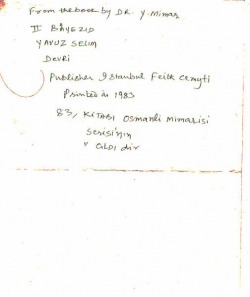 This book was origanally published by Dr. Y.Mimar titled Bayezid-ii Yavuz Selim Devri(the real name of the Turkish Sultan Selim-1 who accompanied the Satguru Nanak Sahib on the Udhasi of Greece and Rome).This was published in Istanbul by M/s Istanbul Feith Cemyti 83, Kitabi Osmanli Mimarsi Serisi'nin v Cildi Dir. This book was reproduced in 1983. (Pages Nos.458 and 60 are taken by courtesy of the Turkish book published in Istanbul in 1983). This drawing belongs to late Vasco-Da-Gama from Sir Richard. 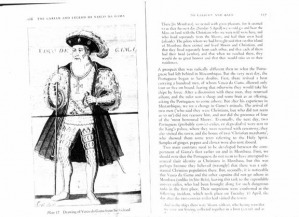 This extract has been taken from the book written by Sanjay Subramanim and published by Cambridge University Press(first edition printed in 1997).The title of this book is The Career And Legend Of Vasco Da Gama. Isbn 0521470722 hard back.This gentleman was made the second viceroy of Portugal in 1524. 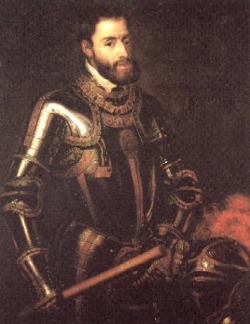 But before this he had three voyages to India in 1498-99, 1502-03 and 1523-24. His ship was unloaded in Calcuta(Hughali Nadi).In connection with his business, he happened to visit Burra Bazaar and attened the darbar of Satguru Nanak Sahib Ji.Burra Bazaar Sikh Sangat had a Dharmsala at that time which was converted into a Gurdwara Sahib later on.Almighty Satguru was doing the katha of Oankaar Ramkali Dakhni(south). He was accompanied by a devotee of Satguru who translated for him. He was impressed by the logic of Almighty Satguru. He returned to Portugal in 1503 where he stayed for a couple of years and regarding his business he happened to to visit Germany and Rome and came in contact with Martin Luther(1483-1546).Hence the knowledge about Satguru Nanak Sahib reached Europe through two persons-the first thorough Neples' Prime Minister G.G.Pontano in 1501 who happened to have a glimpse of Almighty Satguru in Hardwar at the time of the festival of Kumbh.The second being Vasco-Da-Gama who returned to Portugal in 1503. 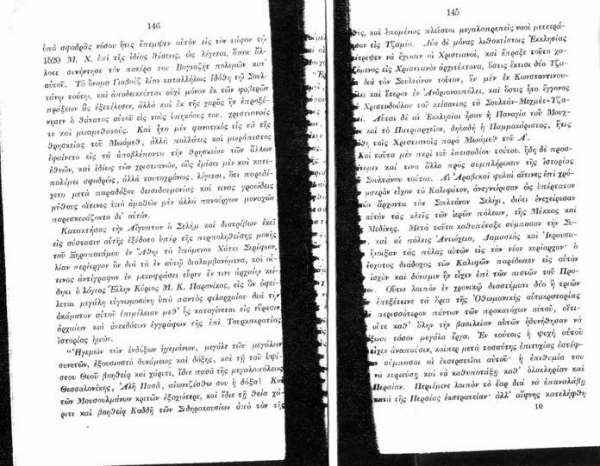 Pages 145and 146 of a Greek Book. This the photocopy of a Greek book which confirms the presence of Turkish Sultan Selim-1 of Ottoman Empire in Medina in the early months of 1520.In Madina, Turkish Sultan Selim-1(9th Sultan of Ottoman Empire).His father visited Almighty Satguru Nanak Sahib in Ajmer in 1511(kindly note that Satguru was in Rajasthan in 1511 according to our history books and Janamsakhis). From Madina onward the Turkish Sultan Selim-1 accompanied Almighty Satguru Nanak Sahib en route Greece and Rome(by courtsy of Genesis Library, Athens). This village of Kastro is 10 km from Limeneria.It is located on the top of a beautiful hill which is all green. 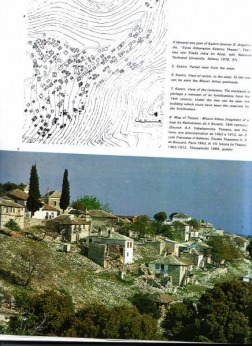 But the houses are very old.The church,Satguru's residence,Defence building are there but they houses the churches there.The fortification reservoir have been turned to a cemetery which is the worst example of our negligence(by courtesy of the book on Thasos published by Malissa publishing House, Athens). This the picture no. 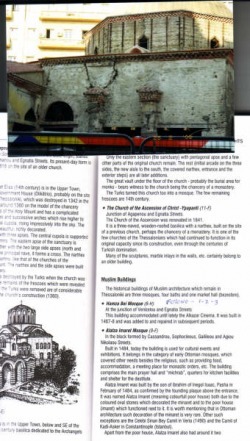 4 and 5 of the book orignally published in Greek language and translated into English by Melissa Publishing House,Athens(Greece).It gives the pictures of church and defence building which is on right of this picture.But the statement given under the title no. 7 leads to melancholy and sadness,because the fortication of the reservoir has been unfortunately turned into a cemetery(by courtesy of the book orignally published in Greek and translated into English by Melissa Publishing House,Athens). Village Kastro in Thassos Island(Greece). The blue building on the righr side of this picture was the defence building and on the adjecent of it under the tree was a reservoir. In this building the Sultans of Turkey used to stay with the security(by courtesy of the book originally published in Greek and traslated into English by Melissa Publishing House,Athens). By zooming the right side of this picture no. 7 is clearly visible the defence building which houses the second church of Kastro.The description mentions that these buildings were built in 13th century, some of the buildings have been repaired with the passage of time.Some others are quite old.But the reality is that the truth never gets old and the truth will come to the public one day or the other.On the left side of this picture is the sketch of the 15th century map(in yellow colour)(by courtesy of the book orignally published in Greek and translated into English by Melissa Publishing, Athens). The Beauty Of Mt. YPsario. From above, we can see the beauty of the mountain Ypsario and the small hill of Ipsario.Both hills are of fish type. 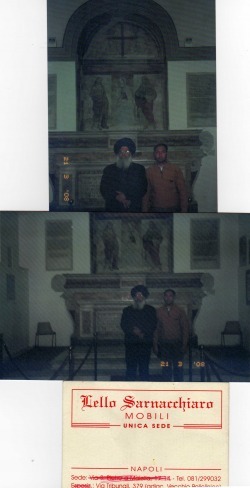 Yari is called fish or Machhi in Greek.In the second picture the main gate of the holy church is seen where Satguru Nanak Sahib annd Martin Luther stayed and spoke in Persion in 1520.The seen in this picture are from left to right--Mr. Paramjit Singh,Bhai Harpal Singh Kasoor, Chamkaur Singh Gill and his son.The third picture belongs to Almighty Satguru Nanak Sahib's residence.The doors and windows were changed in 1945. (from my album of Greece). 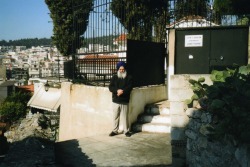 Satguru Nanak Sahib in Kastro. The first photo belongs to the buildins where Almighty Satguru spent a Couple of days with Martin Luther,Bhai Sahib Mardana Ji, Sultan Selim-1 and others. This is one side of the holy building. 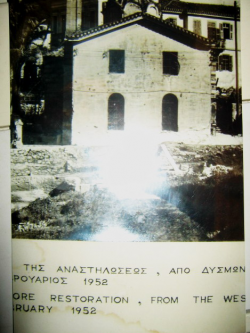 This is one of the oldest buildings in Kastro which were repaired in 1945 which itself is mentioned on this building.The second photo belongs to the Defence building of Kastro. It was used as a defence purposes before Greece's independence in 1832.Now there is the second church in it. Third picture belonged to the arms reservoir which is now used as a cemetery.This building is just(7 Karams or about 39 feet away from the defence building). (Photos taken from my album of Greece). Thessaloniki is about 80 kilometres from Thassos Island by ship. Satguru Nanak Sahib, Bhai Sahib Mardana Ji, Sultan Selim-1, Martin Luther reached Thessaloniki by boat from village Kastro(Thassos Island).Almighty Satguru and Bhai Sahib Mardana Ji stayed in the Mosque(which has many rooms).This mosque is called Hamza Bei Mosque, which is located at the junction of Venizelou and Egnatia Streets. This building accommaded untill lately the Alkazar Cinema. It was built in 1467-68 and was added to and repaired in subsequent periods. This photo is taken from my album of Greece. 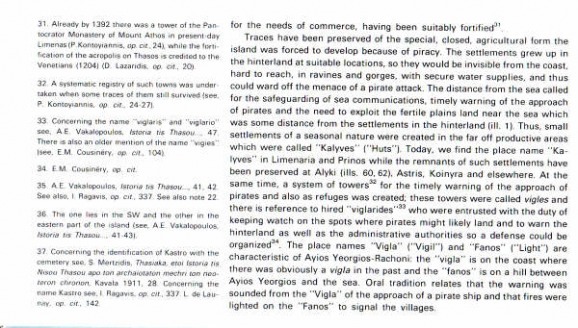 (by courtesy of the book published by a Ministry of Greece). Building Where Martin Luther Stayed. This is 18 no. building on Theophilou St., which is under protection. 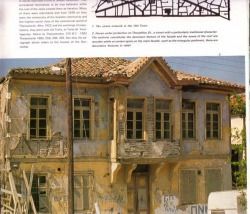 This photo has been taken from for courtesy sake from the book published by Melissa Publishing House, Athens. Martin Luther stayed in this building in march of 1520. He was thoroughly impressed with the logics of the Almighty Satguru Nanak Sahib Ji(by courtesy of the book published by Melissa Publishing House,Athens). Office of the Sultan in Thessaloniki. (Picture no. 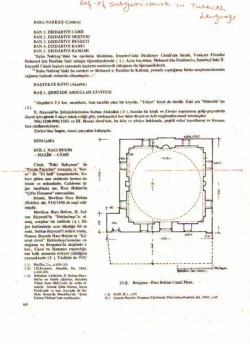 1)The Rotunda is centrally planned and ows its name to its shape.It was built in AD306, in the reign of Galerius Caesareither as a temple of Zeus or Kabeirosor as the Emperor's mausoleum.The minaret was built and it was turned into a mosque. 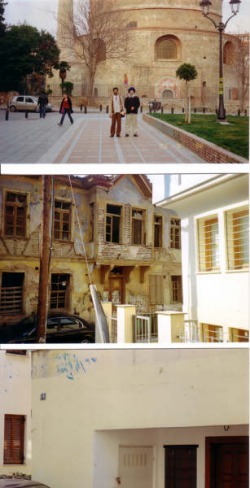 Earlier it houses the offices of the Sultans of Ottoman Empire(With the courtsy of The Ministry Of Culture, Greece).Seen in the picture(from left to right) are Mohammed Rehman and Bhai Harpal Singh Kasoor. (from my Album Of Greece). (Picture No. 2)This is the side of the building where Martin Luther stayed. (Picture No.3) The same no. 18 has been allotted to the private house whereas the original building has been kept under protection.This private house is adjecant to the original building. Satguru Nanak Sahib on Mt. Olympus. Mount Olympus is in the town of Platamon which is about 120 kms by ship from Thessaloniki. The whole team came to Mt. 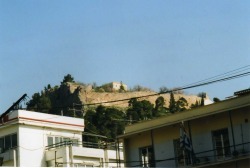 Olympus by ship.This is the picture of the Kastro(Castle) where the building named Illahi Nur was situated.The reference of this building has been mentioned in the page no. 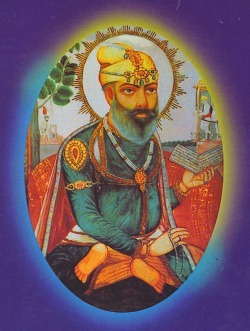 128 of Giani Lal Singh Sangrur(by courtesy of the book published by Ministry of Culture,Greece in Athens). Why The Mosque Has Been Changed to Church. 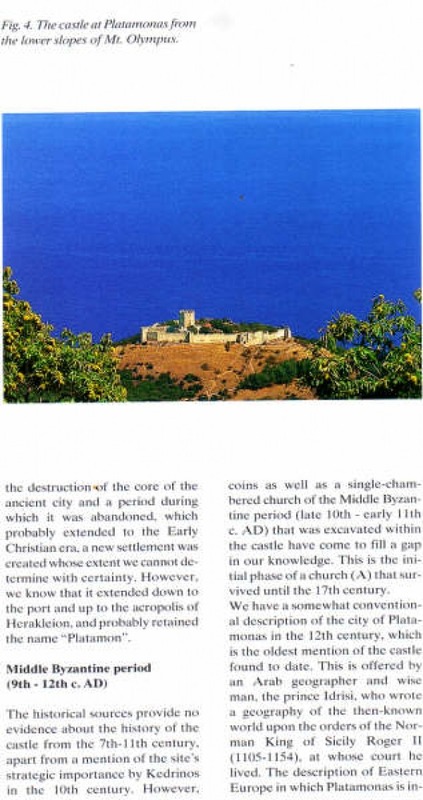 Kindly read 'Modern Building' and you will find every thing clear.There was a mosque in this castle before 1832 when Greece was made independent from Ottoman Empire. The meaning of Agia Praskevi is Illahi Nur in Greek Language.There was a minaret which can be seen in the book Travels in various Countries of Europe,Asia and Africa published in 1816 by Edward Danial Clarke.It is linked to the most important church which was destroyed to construct a mosque on its ruins(by courtesy of the book published by Ministry of Culture, Greece in Athens). A Small House on the East. 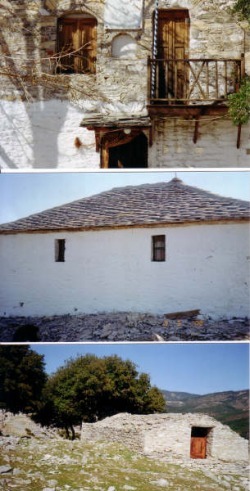 This is the picture of the lucky house on the east side of the mosque 'Illahi Nur' where Almighty Satguru Nanak Sahib and Bhai Sahib Mardana Ji stayed for a couple of days.The room is no more but the foundation of the room is intact.Agia Paraskevi is 'Illahi Nur' in Greek language(by courtesy of the book published by Ministry of Culture, Greece in Athens). The well for Water System to the Castle. This is the well for water system to the Kastro(castle). The water which was used for the morning bath by Almighty Satguru And Bhai Sahib Mardana Ji(Photo taken from my Album Of Greece). 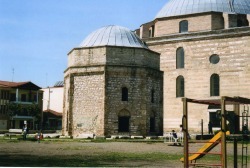 The Illahi Nur Mosque and the Turkish Castle(Kastro) was fully Rebuilt by Sultan Suleiman,the son of Selim-1 in 1525 A.D. Satguru Nanak Sahib and Bhai Sahib Mardana ji stayed in the Old building of the Turkish Castle, the picture of old building is the second picture which is given on the left side which has the caption 'Trikkala'(by courtesy of Municipal Library, Trikkala). Satguru Nanak Sahib came to this town from Vales of Temps situated midway from Larissa and Mt. Olympus(Photo taken from my Album Of Greece). This is the picture of the Holy Mosque and the side wall of the Turkish castle (Kastro). Also seen in the picture are( from left to right) MR. Ranjit Singh Bant and Bhai Harpal Singh Kasoor(from my Album of Greece). The whole team (Kafla) reached Polio Kastro,a village near Kardisa which is about 55 kms. 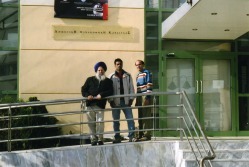 from Trikala.Seen in the picture (from Left to Right) are Bhai Harpal Singh Kasoor, Mr. Ravinder Singh and Mr. Ranjit Singh alias Bant(from my Album of Greece). The Mosque Illahi Nur had been dismantled by Greece dictator after 1832. 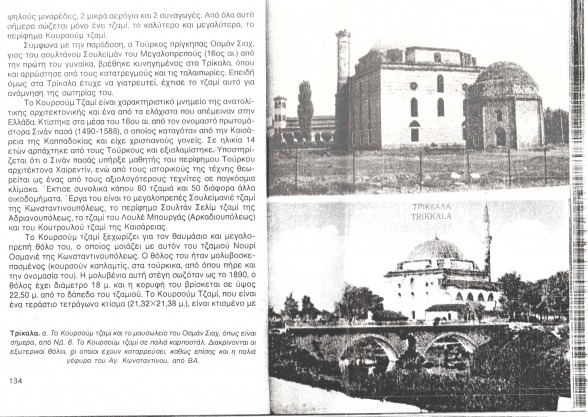 There were the Mosques of Illahi Nur series in Greece before itsIndependence in 1832 from Ottoman Empire.The dictator of Greece had dismantled the Mosque and built a church in its place.The Library of Municipality(Demorkhi) record confirmed it.In the building with a Minaret,Almighty Satguru Nanak Sahib and Bhai Sahib Mardana Ji stayed for a couple days(by courtesy of Demorkhi(Municipality) Library, Lamia). Satguru Nanak Sahib in Lamia. From Polio Kastro the whole team came to Lamia which is about 90 kms. from Kardisa. This ts the picture of Lamia Fort which is called kastro in Greek language.Before 1832 (when Greece was made independent from Ottoman Empire) there was a Mosque in front of the Kastro which was made ruins by the Greece dictator and a church was built on the ruins.The Lamia Municipal Library has supplied me a photograph which ig given above for the kind information of the congregation lateron(from my Album of Greece). 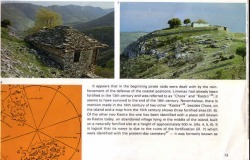 The Kastro and the church were used as Jail. 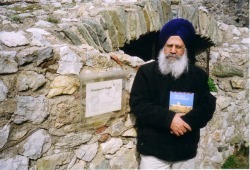 The writer of this site ,Bhai Harpal Singh Kasoor in fron of the new church(from my Album of Greece). Satguru Nanak Sahib came to this Sea-port from Vlore(Albania). This is the Borque Sea-Port which is just 11kms from Lecce. Satguru Nanak Sahib, Bhai Sahib Mardana Ji and others including Nicholas Copernicus reched this sea-Port in 1520.This place is just 80kms from Vlore by sea. Almighty Satguru knew that one of the passengers in the same ship knew Persion Language that is why He ordered bhai Sahib Mardana Ji to set the Rabab(Reboc is called in Europe) in Ghar 2 and play Sri Raag on it.Kindly note that the ship left the sea-Port of Vlore in the afternoon.Almighty Satguru recited and gave the mortals these Holy Lines-- Sri Raag Ghar 2 Mahlla 1----'Mukam Ghar Kar Baisna Nit Chalne Ki Dokh--' Holy Page 50 of SGGS. In the last of this Holy Shabad the Almighty Satguru confirms that Din Rav Chaley Nis Sash Chaley Tarika Lakh Ploy, Mukaam ohi Ek Hai Nanaka Sach Bugoe'.When Almighty Satguru uttered the word "Bugoe"Copernics immediately came to know that this saint knew Persion. Copernicus had told the Christian world that it is the Earth not the Sun which circle around the Sun, but no body believed his statement. This Mahan-Purakh is absolutely right when He says that the Sun Revolves round its centre. 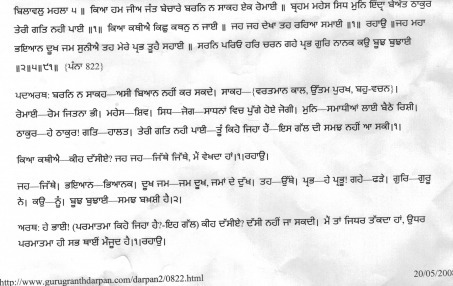 Koh Karori Chalat nan aant "ASA JI DI WAR".The first Shabad of Raag Tilang Is also uttered on the chest of the ocean. 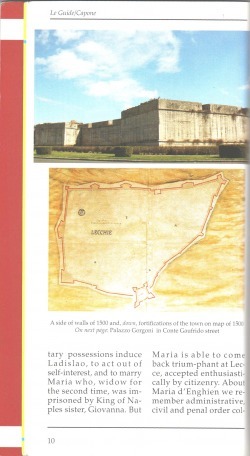 (by courtesy of the book Lecce-Historicl-Artistic Guide by Lorenzo Capone). This is the picture of side wall of the casle of the Roman Emperor, Charles-v. It was built in 14th century but it was renamed after Charles -v.It has the church in front of it.Almighty Saturu stayed in this castle and copernicus arranged the Diwans of Satguru Nanak Sahib in this church too. 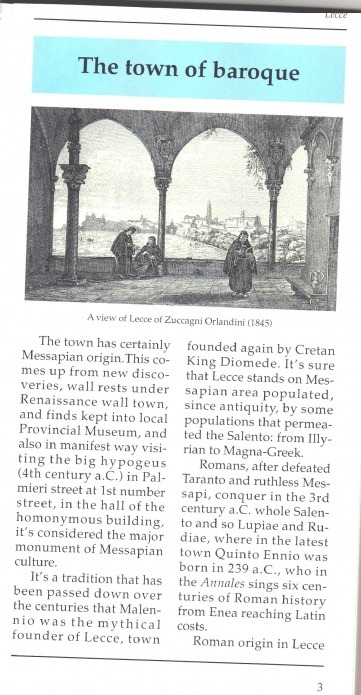 (by courtesy of the book Lecce-Historcal-Artistic Guideby Lorenzo Capone). This is the picture of the Roman Emperor Castle in Leece which is situated at the intersection of Pettriot st. and University Ave.This is locked from the outside and on sale. A new plaza is about to be built here. Once the plaza is constructed, the memory of Almighty Satguru Nanak Sahib and Bhai Sahib Mardana Ji will become a part of the distant history, but the truth of Its reality shall never be erased at all(my appeal to the Holy Sadh- Sangat Of Europe in particular and Sadh- Sangat Accross the world in general to buy some land of this castle if not the whole castle,so that the Holy memory of Great Satguru remains for ever in physical form. No doubt He is with every one spirtually). Satguru Nanak Sahib accompanied by Nicholas Copernicus reached the port of the Town of Boroque which in Lecce(it is only 11kms from the Mediterrian Sea. The distance between Vlore(Albania) and Broque(Lecce) is just 80 kms.There is a church in front of this castle of the Roman Emperor Charles-v where Copernicus, Nicholas stayed in 1520. (from my Album of Italy). This Castle of Roman Emperor, Charles-v in the city of Lecce in Italy where Almighty Satguru Nanak Sahib and Bhai Sahib Mardana Ji spent a couple of days whereas the Nicholas Copernicus stayed in the church just infront of this castle.This castle was built in 14th century A.D. and now is locked and on sale.This picture was taken on March 19,2008 when Bhai Harpal Singh Kasoor visited this city.Seen in the picture is Bhai Kasoor. (from my Album of Italy). 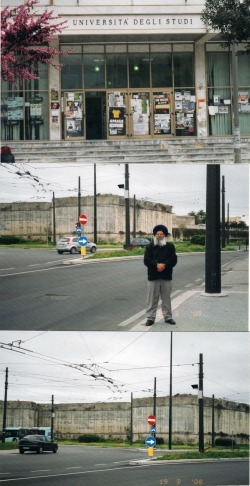 This is the picture of castle of Charles-V on the University Ave.Bbhi Kasoor is seen on the south side of the castle.Second picture is taken from the East-SideThe third picture belonged to the holy church where Nicholas Copernicus has arranged Diwans of Almighty Satguru.Seen in the picture (from left to right) are Bhai Harpal Singh Kasoor and Dr. Marcello(whose clinic is nearby) (from My album Of Italy)..
Main Intersection of the castle. 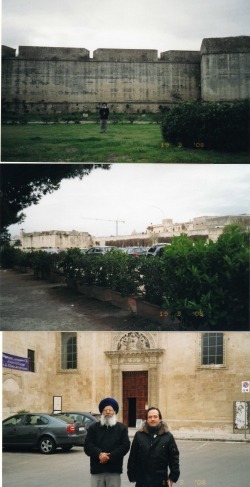 The first picture is of the University of Lecce.In second picture Bhai Harpal singh Kasoor is seen on the other street of the intersection of the Castle where Satguru nanak Sahib and bhai Sahib Mardana ji stayed in one of the room in 1520 en route to Rome. In the third picture the intersection is clearly visible(from my Album of Italy). Satguru Nanak Sahib in Vatican Rome in 1520. 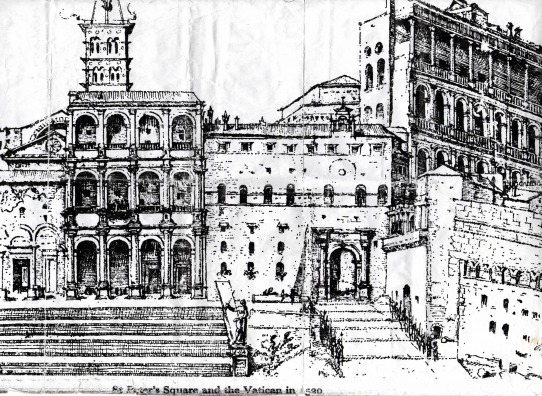 This is the picture of a drawing by a Dutch painter,which shows how the St. Peters Square and Vatican was in 1520. On the right of this building Satguru nanak Sahib and Bhai Sahib Mardana Ji stayed with the Pope(1513-1520) Leo-X, for three days.in 1520(by courtesy of the German book Luther by Richard Friedenthal, translated from German by John Nowell in 1970. This drawing was made by the Dutch -Painter(a friend of Martin Luther) named Maartan Van Hemskerk in 1532). Old Building at the Vatican stay of Satguru Nanak Sahib. This building comprises the residences of nuns and the catholic Pope and the other offices of the Vatican. This building is situated near Ottaviano Metro Station of the Subway train.This also has the old church(Bassilca)( From my Album of Italy.). The New Church at the Vatican. The new church(Bassilca) was completed in 1550.There is strict security at the old building and the old church by the Swedish Guards.Seen in the picture no. one(from left to right) are Mr. Ramandeep singh, Bhai Gurdeep singh, Mr.Sarup Singh and Bhai Harpal Singh Kasoor. 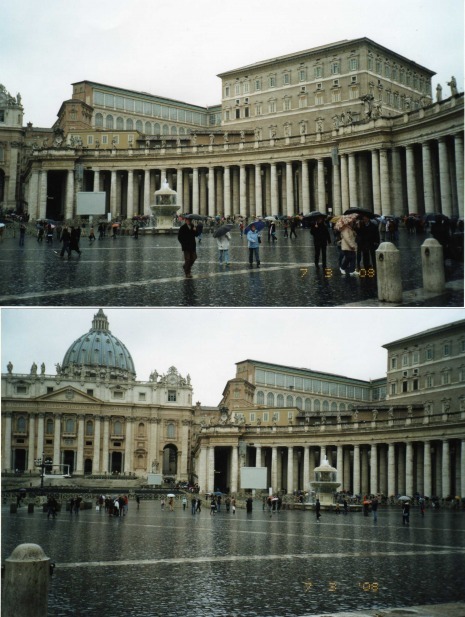 The second picture shows that the old church, the residences of Nuns and the Pope, the Vatican Offices are strictly guarded by the swedish guards. Seen in the picture no. 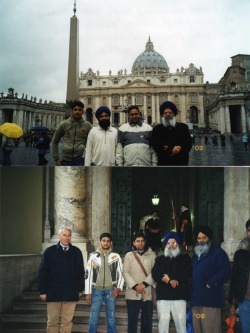 2 are Mr.slovanio(the incharge of the security at the vatican, Mr. Ramandeep Singh, Mr. Arif Siddique, Bhai Harpal singh Kasoor, Bhai Balkar singh(President, Management Committee of Guru Nanak Darbar, Rome) and Mr. Paramjeet Singh Dosanjh(not fully visible)( From my Album of Italy). Inside of the old Church. 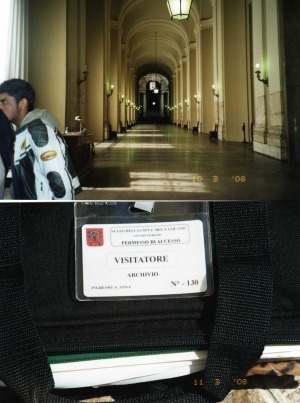 My badge of the Vatican confirms to the records of the Vatican which is computerised in Italian Language. (from my Album of Italy). 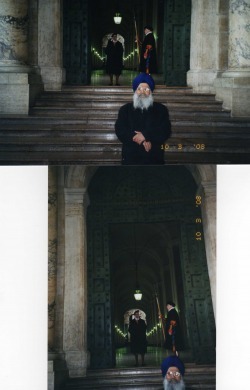 Bhai Harpal Singh Kasoor is in front of the guarded old Church at Vatican, Rome. (from my Album of Italy). 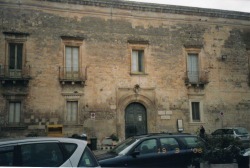 This the picture of the Pontano Chapel which is located on 65, Tribunali Street(Via dei Tribunali)'Via'is called street in Italian.It was constructed in 1492 in the memory of Pontano's wife and son. 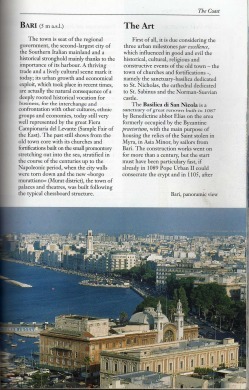 ( by courtesy of the book on Naples by Kina Italia). The Street, Tribunali in Naples.. This is the outside of the holy church where Satguru Nanak Sahib and Bhai Sahib Mardana Ji stayed twice on first on their way to Rome via Formia and then from Rome via Formia again on their way to Bari.This chapel was built in 1492 in the memory of Pontano's wife and son who died.Seen in the picture are(from left to right) Mr. Sarup Singh and Bhai Harpal Singh Kasoor(from my Album of Italy). This is the inside of Pontano Chapel. This about 13 metres into 13metres size. 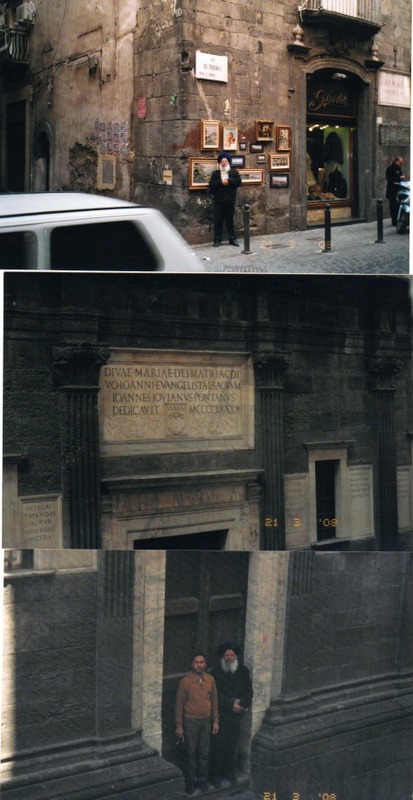 It has about 13feet high roof.On the right of it once Almighty Satguru and Bhai Sahib Mardana Ji stayed and on the left of it stayed Nicholas, Copernicus(while Going to Rome) and Leo-X(while coming from Rome.Third picture is of the visiting card of the owner of the store in front of the Pontano Chapel who has taken the picture of the chapel and of us from the second storey of his store. Without his timely help we could do nothing as the road in front of this chapel was very small(from my Album of Italy). Satguru Nanak Sahib In Bari. Satguru Nanak Sahib had many Diwans in this buildg in red colour, as there was a church in it. They stayed in the castle which is covered separately. (with courtesy from the book' Terra Di Bari' by Stefania Mola published in 2005). The castle where Satguru Nanak Sahib Stayed. 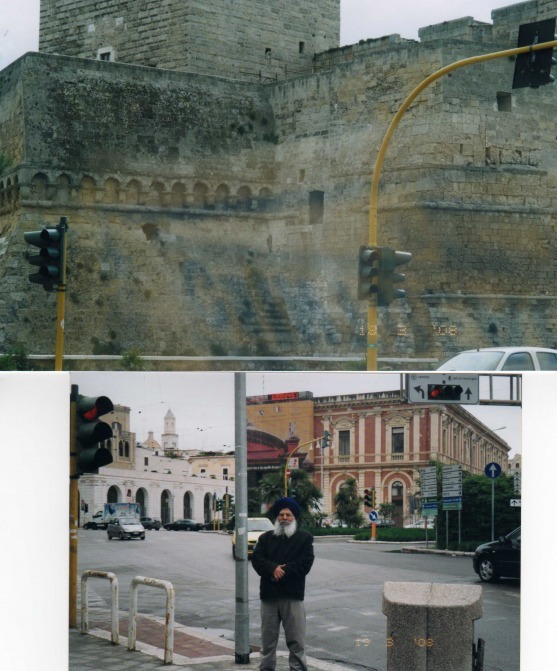 These are two different sides of the castle where Almighty Satguru Nanak Sahib and Bhai Sahib Mardana Ji stayed for a couple of daybefore leaving Italy and on their way to Albania.The Pope, Leo-X, bade them goodbye on this sea-port(By courtesy from the Book 'Terra Di Bari' by Stefania Mola published in 2005). West side of the Castle. The building which had the holy Diwans of Satguru and Bhai Sahib Mardana Ji. 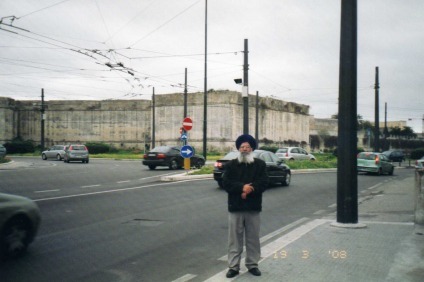 Near the sea-port is seen Bhai Harpal Singh Kasoor(from my Album of Italy). In 1520 the Almighty Satguru Nanak Sahib and Bhai Sahib Mardana Ji left for Albania's sea-port'Durres'. 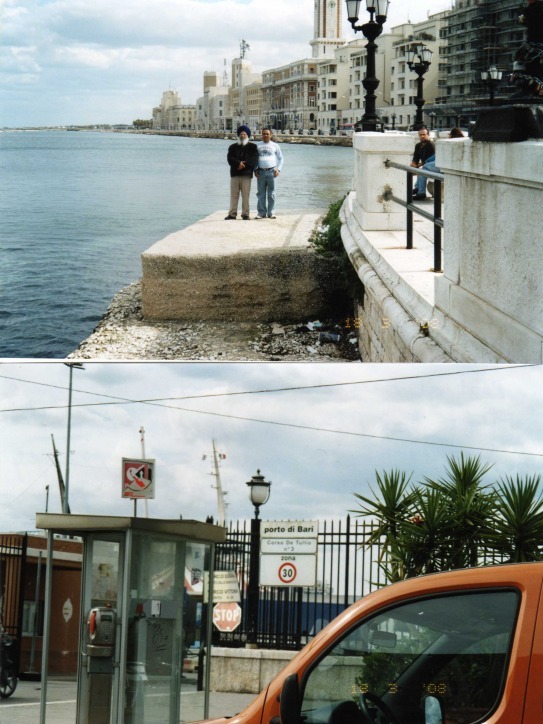 Second picture is the Port of Bari'Port Di Bari'. (from my Album of Italy). Conclusion of the Whole Trip to Greece and Italy. This is the title page of the book written and published in 1816,by Edward Daniel Clarke, the historian and traveller.In this book he has given the picture of a mosque in place of a church on Mt. Olympus now(by courtesy from the book' Travels in Various countries of Europe. Africa and Asia by Edward Danial Clarke, published in 1816. Now There is a Church (Illahi Noor Church(, Earlier There Was A Mosque of the Same Name( by courtesy of Thomas Fisher Rare Book Library). 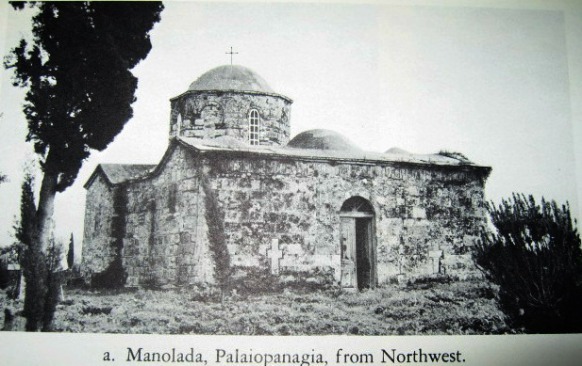 Earlier there was a mosque of Illahi Nur in place of the church of Agia Provaskvi. Picture of that Mosque is seen on this Mt. Olympus(By courtesy from the book Travels in Various Countries of Europe, Africa and Asia by Edward Danial Clarke published in 1816. Page 271 of the Same Book. The poem below gives the definition of a temple in the Valley(by courtesy from the book Travels in Various Countries of Europe, Africa and Asia by Edward Danial Clarke Published in 1816). The Village Baba and Others in Vale of Temps. 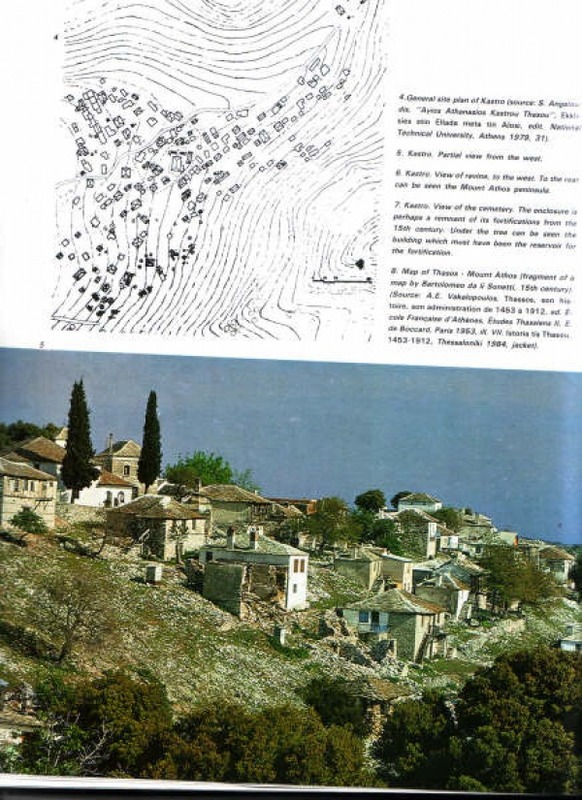 Eighteen villages including Baba is located in the valley of Temps, which is midway from the city of Larissa and Mt. Olympus. Satguru Nanak Sahib and Bhai Sahib Mardana Ji had Diwans for three days. It were attended by the Ottoman Empire and first Caliph, Selim-I and his courtiers(by courtesy from the book 'Travels in Various Countries of Europe, Africa and Asia by Edward Danial Clarke published in 1816). Page 300 of the Same Book. Village Baba and others were relieved of the robbers.Satguru Nanak Sahib and Bhai Sahib Mardana Ji were called sacred victims by those robbers. (By courtesy from the book 'Travels in Various Countries of Europe, Africa and Asia by Edward Danial Clarke published in 1816). Governor of Athens in 1816. 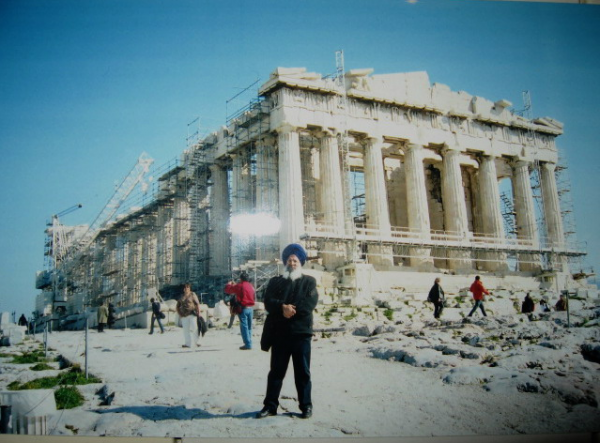 The impact of Almighty Satguru Nanak Sahib's preaching is visible in whole of Greece and particulaly in the valley. 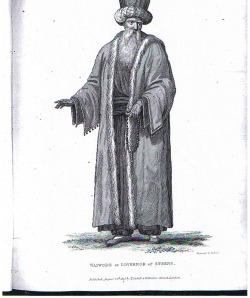 The Greek people do the Simran in Greek Language'Agia Fouse' meaning thereby Illahi Nur or Satkartar.Sikh preaching is the need of the hour in Greece(By courtesy from the book'Travels in Various Countries of Europe, Africa and Asia by Edward Danial Clarke published in 1816). Routes from Athens to Thessoliniki. 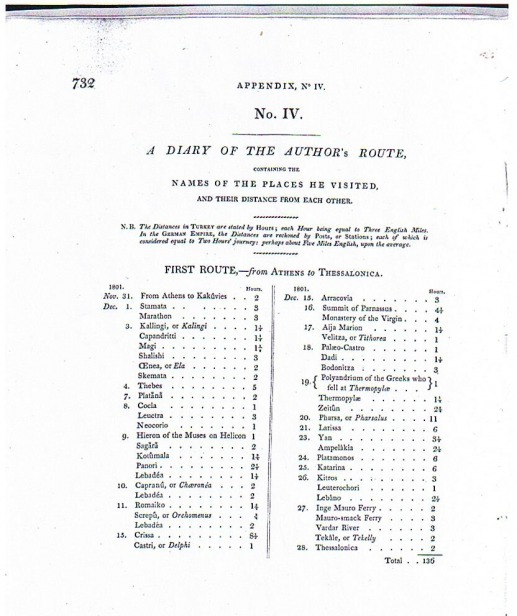 This is the picture of the route taken by Clarke in 1816 from Athens to Thessoliniki. 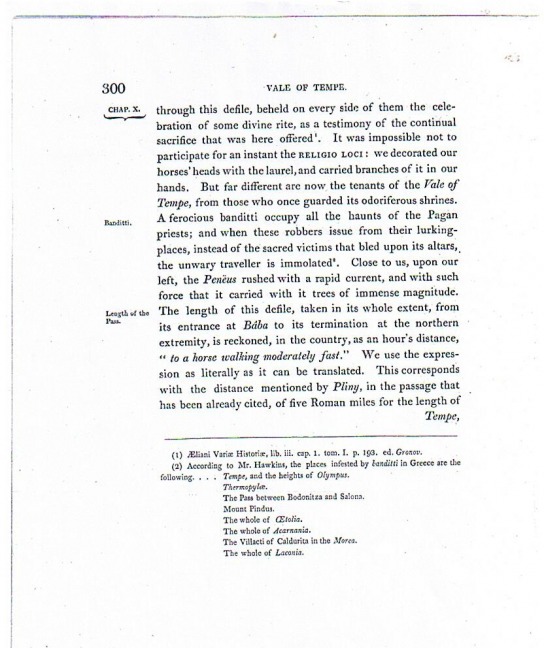 Hassan Baba is a village in the Vale of Temps in Greece(By courtesy from the book' Travels in Various Countries of Europe, Africa and Asia by Edward Danial Clarke published in London in 1816). The word 'Jog' comes to Sanskrit from Greek. Page10 of 'The Sikh Religion' by Maculife confims that the word 'Jog' comes to Sanskrit from Greek Language.This word comes from'yogun' in Greek which means' the union'. Satguru Nanak Sahib in Baghdad in 1520 A.D. According Sikh chronicals and other history books, four paintings of Satguru Nanak Sahib were made by the different painters of this world .One of the men of Martin Luther named Lucas Cranach the Elder, made the oil painting of Satguru Nanak Sahib(as told by Prof. Baljit Singh Grewal"Sayyad" of S.D. Government College, Ludhiana and Dr. Ganda Singh,1978.The second painting of Almighty Satguru was made by a painter of Khair Buck, the worthy Governor of Ottoman Empire in Cairo from 1517-1519.Satguru was in Cairo(Africa) in 1519.The third painting in question, was made by Kamal-ud-din Behzad (1450-1535) of Tabriz, in Beghdad, when he was returnig from Haz on his way to Tabriz and accompaning Jiwan Qazi .Almighty Satguru Nanak Sahib was in Baghdad from November, 1519 to January,1520. Jiwan Qazi of Uch in Multan Division, brought in Multan in 1521 A.D.Fourth painting was made by the painter of Daulat Khan Lodhi and Rai Bular Bhatti of Nankana Sahib in 1509, when Almighty Satguru and Bhai Sahib Mardana Ji returned from first Udhasi. They wanted to keep that photo in the absence of Almighty Satguru from Nankana Sahib.From 1978, I have been able to find only one painting of Almighty Satguru and that is with the courtesy of Bibi Gurmit Kaur Sarpal and Bhai Dharam Singh , both of Calgary(Canada), who got this painting of Baghdad from a Sikh Shrine in Sri Kartarpur Sahib. For the other three paintings, I feel apology from the Holy congregation. This is the original paintings of Satguru Teg Bahadur Sahib, as painted by a painter of Dacca in 1667, when the satguru Sahib was in Dacca in his second journey which he undertook after becoming the Ninth Nanak.In 1985, I went to Calcutta, for some work of Punjab National Bank,I happened to visit Victoria Museaum and saw this valuable painting of Almighty Satguru Teg Bahadur Sahib there. Now I was able to get this rare treasure of Sikh Panth.Though we donot worship photos, still it has the great physical proof of Satguru's lives on this earth.A book first printed in 1997, printed this painting on its title-page. the name of that book is" Guru Tegh Bahadur-Hind- Di- Chadar, published by,Guru Tegh Bahadur Foundation, New Delhi, 1999. This is the original and authenticated portrait of Satguru Gobind Singh ji, painted by an artist, a friend of commander Saidh Khan of Mughal Government after the latter became Sikh in 1701 at Sri Anand Pur Sahib War . This painting reached the residence of Saidh Khan in Delhi and finaly to Mughal Court and Hazur Sahib.This painting was obtained by the courtesy of Shri Joginder Singh , advocate, Punjab And Haryana High Court, Chandigarh. This book written in Portuegese language shows that Doctor Nicholas Mannuci had attended Satguru Gobind Singh in 1708 at Nanded.This book had four voumes and is written by the doctor himself.This book was translated in English by William Irvine. This Book Show that He was the Official Surgeon of Dara Shikoh& Bahadur Shah. Page-379 of "Storia Do Mogor" Reveals the Truth. The foot-note of this page of The Panjab, Past And Present, tells the name of the Doctor as Kal. The full name of the Doctor was Niccolao Manucci, who was the Physician of Bahdur Shah.Earlier he was the official doctor of Dara Shikoh.Dhian singh is absolutely correct,when he wrote in his manuscript"Daswain Patshah Ka Antim Kautak". 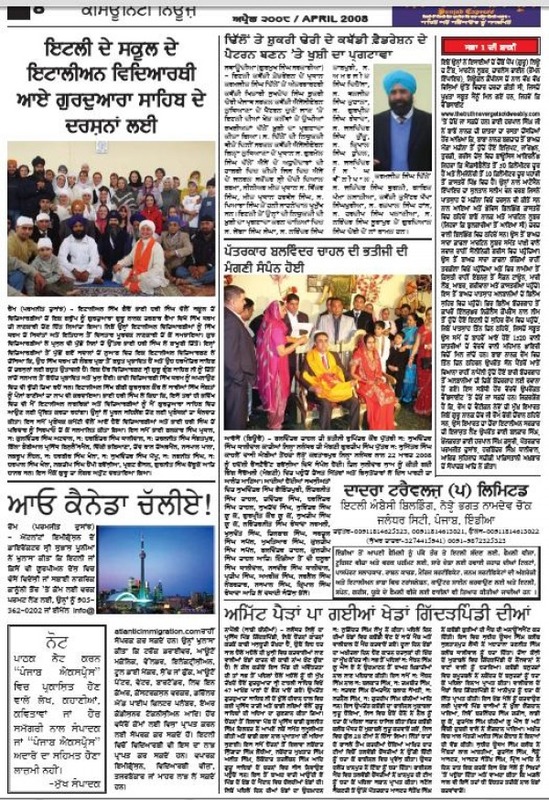 April,2008 Edition of Punjab Express, Rome. The message of Almighty Satguru Nanak Sahib has been flashed to the different corners of Europe by Punjab Express, April 2008 edition. I am indebted to the whole management committee of Guru Nanak Darbar, Rome and the whole Sadh-Sangat of Italy and Greece as well as the individuals of different communities. (By courtesy of Bhai Harbinder Singh Dhaliwal and Mr. Paramjeet Singh Dosanjh). Page no. 8 of Punjab Express. Satguru Nanak Sahib and Bhai Sahib Mardana Ji stayed in this Temple in September 1520 in the begining of the month of Ramzan. Ismail-I alias Karun, who was the King of Azerbaijan, had a meeting with almighty Satguru Nanak Sahib. Ismail-I had conqurred Azerbaijan in 1501 A.D.(reference Memoirs Of Zehir-ED-Din MOHAMMED BABUR published by Oxford University Press, 1921 and Baku -An Eventful History and Zindgan-E-Shah Ismail_E aval(Persion) and various History Books.) 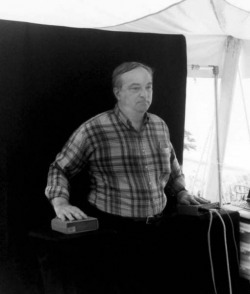 This Photo is taken as a token of courtesy of the Picture-Gallery of Toronto Public Reference Library. This is the photo of the holy description of Mul mantra and first Slok of Japuji Sahib in Baku, Azerbaijan formerly U.S.S.R.This inscription was erected by masons under the guidance and instructions of the Emperor,Shah Ismail-I in 1520 when some parts of the Surakhany Temple were extended.The last three lines clear this. Ismail-I also became the disciple(Chela) of Satguru Nanak Sahib.The word Ajooni is clearly visible which confirms that Mul Mantra was written from the book which was with Satguru Nanak Sahib.This Mul Mantra and the first Slok of Jauji Sahib was not written and tally with Sri Guru Granth Sahib Ji because the word was written as Aajooni instead if Ajooni.This mistake occurred because they were copied from the handwriting of the Almighty Satguru and was erected in His absence when He and Bhai Sahib Mardana Ji went to Bukhara( in earstwhile Khurasan)after crossing the Caspian Sea by boat.The word 'Chela' clearly confirmed that Bhai Sahib Mardana Ji was His only companion.This photo is taken by the courtesy of www.avesta.org/modi/baku.htm. Special thanks to Sh. Jivan Modi for his vast knowledge of Soviet and Middle-East History,because he had confirmed this factin his article that Azerbaijan was under the rule of Ismail-I. The title page of the book written by the historian J.D.Henry, published by ARCHIBALD CONSTABLE & CO. Ltd,16 JAMES STREET,HAYMARKET,LONDEN.. 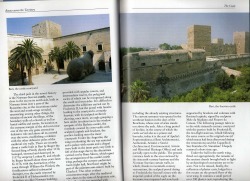 Pages 112, 113 of BAKU- An Eventful History. Page 113 of the said book clearly confirms that SAFAVID DYNASTY was founded by Ismail-I.This state existed from1502 to 1736. Pages 70-71 Of Memoirs Of Babur. Page 70 described the reason of the friendship between Shah Ismail-I and Babur. This page gives very interesting story. As every student of the history knows that Babur fled Samarkand in 1503.But his sister was taken as the war prisoner by Uzbeks.When Ismail-I conqurred the whole of Khurasan including Samarkand in 1513, he returned Babur's sister Khanzadeh Begum.This action of Ismail-I'cultivated friendship' between Shah Ismail-I and Zahir-ud-din Mohammed Babur. 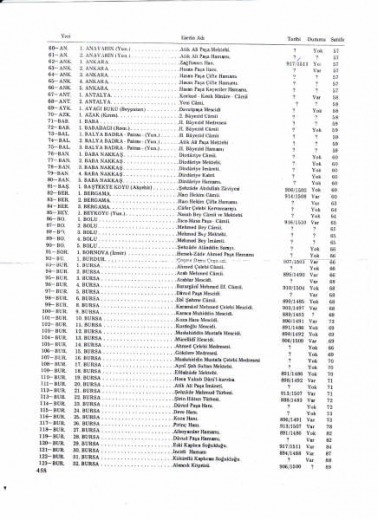 Pages 68-69 of Baku-An Eventful history. The First Meeting Of Babur And Satguru Nanak in Khurasan. This is actually the first meeting of Zahiru-din-Mohammed Babur and the Prince Humanyun at the Ismail Mosque in Bukhara(Khurasan). Humanyun was about 14 years old at that time. Babur and the others came to thje Mosque to read the Namaz in the evening in the month of Ramzan of 1520. In that year the Month of Ramzan began in the middle of September and the Idul-Fitter was in the middle of October,1520 A.D.Babur mentioned that he is said to be a Marad(Purakh) who takes wine, bhang and other intoxicants.But Almightyand fearless Satguru made the defintion of "Marad" and uttered the two Saloks of Mardana -I here.This definition of "Marad" is again clarified by the fifth Nanak, Satguru Arjan Sahib as----"Soi Marad Marad Mardana ----" Holy Page 1084 of SGGS.In these Holy Saloks ther Almighty Satguru clarifies that in this Kaliyug(Dark Age) the wine is being given the wrong ones.This painting is taken as a courtesy from"The Guru'S Word & Illustrated Sikh History by Dr. Santokh Singh, published by Spiritual awakening Studies,Princton, Ontario, Canada,2000. This is photocopy of the book"Zindgani-i-Shah Ismail-I"Which means in English language--The Biography of Shah Ismail alias the second Karun. The first Karun was the cousin of Moosa (Ref Mahan Kosh) This book describe the relations between Ismail and Babur in Detail.They were friends to each other. The Dutch Renamed All Islands. Sikh chronicle say that the names of Satgurus' visits have not been mentioned in Thai chronicals or Burmese chronicals.The clear reason of this is that The Dutch had conquered Burma, Thailand, Ceylon etc. from Poruguese in the early 16th century. The Dutch renamed the all islands in their own Dutch language.The Google gives the modern Dutch Names whereas our chronicals give the old names of the islands in the East. This has been made clear to us by the book written by E.J. Brill "Illustrations and Views of Dutch Ceylon(1602-1796). Hazuri-Sangat of Burma & Thailand. Satguru Har Govind Sahib has deputed Sahibzada Teg Bahadur Ji to East for preaching the message of Satguru Nanak Sahib instead of nominating the 7th successor.This was the extremely wise step of Satguru Hargovind Sahib, some historians underlined it. This pictutre belonged to a Burma tribe of Kachin Hills,and Shan States of Burma and Thailand. The Masand named Bhai Natha of Dhaka has played a vital role in establishing this Hazuri Sangat(reference Mahan Kosh, by Bhai Kahan Singh of Nabha).Bhai Natha was appointed a Masand of Bengal by 7th Satguru Har Rai Sahib, and was made available at the disposal of Sahibzada Teg Bahadur. He accompanied the 9th Satguru Teg Bahadur Sahib upto Chyiang Mai in Thailand.He served as a translater to the Satguru Teg Bahadur Sahib,because he was fluent in Burmese, Arakane.and Bengali and Gurmukhi etc. in 1669 before the Almighty Satguru left for Assam and other surrounding areas of Agartala and Arakan.This picture is taken as a courtesy from the book"Burma Under British Rule", by Joseph Dautremer, published by,T. Fisher Unwin Ltd., London, 1916. Satguru Nanak Sahib and Bhai Sahib Mardana Ji and Bhai Mansukh stayed in this Pagoda in 1502 in Amarpura.Sahibzada Teg Bahadur Ji, Bhai Dayal Das, Bhai Darbari, Bhai Ram Rai, Bhai Dedh Mal,Bhai Natha Bhai Dargah Mall and others stayed in this Pagoda. Earlier, there was a horse-stable nearby it, where every one tied his horse with in May 1661 & 1668-69. Later on, when Sahibzada became Satguru in 1664, He and Bhai Nahta and Bhai Dargah Mall stayed in this Pagoda. (this picture is taken as a courtesy from the book"A Narrative of the Mission to the Court of Ava in 1855", by Henry Yule, published by Oxford university Press, Kuala Lumpur, 1968). Sahibzada Teg Bahadur was in Pagan in May 1661.He accompanied the Prince Pyi (pronouced Pare in Burma.Prince Pyi became King Pare and adopted the name of ' Maha Pawar Dhamma Raja' He went to the capital of Shan States, Ava from Pagan in 1661. Surely this Hukamnama Sahib was issued after the crown ceremony of the Burmese King.Sahibzada Sahib clarified that he had left his family members at Patna Sahib and advised the holy Sangat of Patna Sahib to arrange for a suitable house for his family. (by courtesy from Hukamname edited by Dr. Ganda Singh published by Publication Bureau, Punjabi Universiy Patiala 1999). Sahibzada Teg Bahadur Sahib send Bhai Tiratha Lashkar to Patna Sahib with the Hukamnama Sahib meant for Bhai Dayal Das Bhai Dedh Mall and so on to reach Ava(Burma) quickly to attend the crown ceremony of King Pye Mang alias Maha Pawar Dhamma Raja.He told the Sangat that he left Dhaka four days ago.As there were Sinhalese population settled in Shan States the King of Burma invited the Sinhalese King, Raja Singha-II of Ceylone. Raja Singha had left Trincomali seven days ago. Please note that it took about eight days to reach Rangoon from Sri Lanka in those days. This was the second King mentioned in the Holy Hukamnama Sahib 12.He advised Bhai Bayal Das and others to reach by horses so that they can attend the crown ceremony of Prince Pye Meng. (by courtesy from Hukamname edited by Dr. Ganda Singh. published by Publication Bureau Punjabi University Patiala 1999). Rattan Singh Bhangu's Father's Frind confirmed Satguru Nanak visit to the East in 1810. Lt. Marks Wilks was the friend of the worthy father of Bhai Rattan Singh Bhangu. He wrote the history of South India. In this history book, he has clearly mentioned, that sikhs of Guru Nanak got settled in East, visited by Satguru Nanak Sahib.Satguru Nanak Sahib visited Arakan, Burma, Shan States of Thai Land, Ayuthia, Bankok etc. Bhai Rattan Singh Bhangu' Prachin Panth Parkash Confirms Satguru's Sea-Journey Beyond Ceylon and other Countries. Prachin Panth Prakash, written by Bhai Rattan Singh Bhangu confirms Satguru Nanak's Journey beyond Sri Lanka in 1841. In this Panth Prakash, he has mentioned that he knowingly, abstained from details, because, otherwise, this Granth would have been too big in size.He has mentioned also that Satguru Teg Bahadur Sahib followed the foot steps of Satguru Nanak Sahib and went to the East. Satguru Teg Bahadur Sahib Made an agreement Between Ahom King and Raja Ram Singh in 1669 A.D. This is the photocopy of the book'The North-East And The Mughals(1661-1714) by Sushil Chander Dutta published by D.K. Publications, Delhi,1984.This page clarifiedthe role played by Satguru Teg Bahadur Sahib in bringing about the agreement between Ahom King Chakradhawaj and Raja Ram Singh. The Truth Discovered by Sir Jadu Nath Sarkar in 1912. The followers of the King of Arakan concealed the fact and spread the false news that Suja and his family have run into the jungle.This was a totol lie which was told to Aurangzeb.Aurangzeb belived till his death in 1707 that Suja and his family members had met the fate like Dara Shikoh and Murad, which was actually not.The King of Arakan had married the beautiful daughter of Suja, the deposed Governor of Bengal.Suja had met Sahibzada Teg Bahdur at Tippera. A brief discussion on this transitory world took place between Sahibzada Teg Bahadur and Suja.The Sahibzada Ji told him that even the kingdom of this whole earth will go one day. Nothing is permanant in this world.Waheguru has made arrangements for every one. The king of Arakan has given those twelve villages of Bengal to Suja for his nourishment.For your kind information,those twelve villages were given to Arakan by Chittagong authorities. Arakan has won Chittagong in 1459 till it was conqured back by Aurangzeb in 1666. ( by courtesy from History of Aurangzib, Vol-I&II by Sir Jadu Nath Sarkar, published by,Orient Longman Ltd., Bombay, 1973.Its first edition was printed in 1912). 'Pyi' is pronounced as'Pare' in Burmese language. ( by courtesy from The Concise Dictionary of World Places-Names,by John Everett-Heath, published by,Oxford University Press,New York,2005). Sinhalese King Raja Siha-II was invited by King of Burma to attend his crown ceremony scheduled in May 1661.Raja Siha-II was the King of Ceylon from(1635-1687). ( by courtesy from "Culture of Ceylon In Mediaval Times", by Heinz Bechert, published by,Franz Steiner Verlag Wiesbaden GMBH, Stuttgart, Germany,1986. History of Burma Confirms the Crown Ceremony. The crown ceremony was was scheduled in May, 1661.The Prince of Burma was to be sworn as the King. His actual name was Pyi (Pare) Meng but he has adopted the name of 'Maha Pawar Dhamma Raja". ( by courtesy from History of Burma Including Burma Proper, Pegu, Taungu, Tenasserim And Arakan" by P. Phayre, published by August M. elly Publishers,New York, 1967.Its first edition was published in 1883).